Rajinfo Technology Services Pvt. Ltd. in one of the leading outsourcing service provider for Data Solution, Language Solution and HR Solution. 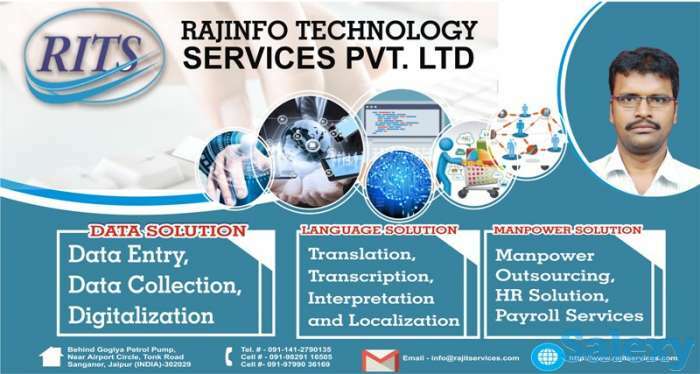 The outsourcing services of Rajinfo Technology Services Pvt. Ltd. include Data Entry, Data Collection, Digitization, Data Scraping, Market Survey, Translation, Transcription, Interpretation, Localization, Manpower Supply, Manpower Placement, Project Hiring, Event Hiring and Complete HR Solution.